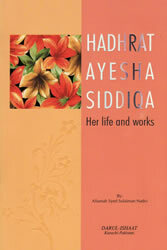 Hadhrat Aayesha (may Allah be pleased with her) who carried the name of Siddiqa was addressed as the mother of Believers. She had no children, her father was Abu Bakr (The Fist Khalif) and her mother was Umm Roman, Extraordinary people reveal their greatness from their earliest years. Aayesha was no exception, her manners were sublime. Syed Sulaiman Nadvi, a noted historian and scholar, has written this marvelous book based on the most authentic sources about the life of the Prophet’s wife Ayesha Siddiqa, may Allah be pleased with her. She became one of the most important reporters of Hadith. Both men and women came to learn about Islam from her. Her life shows how a Muslim woman can use her intelligence and scholarship to make enormous contributions to the cause of Islam. Posted on October 19, 2011, in Aisha رضّى الله عنها, Books and tagged Aisha رضّى الله عنها, Books. Bookmark the permalink. Leave a comment.